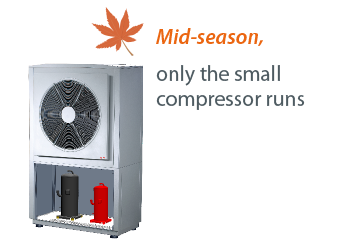 New compressor optimised to be used with the eco-friendly fluid R290. 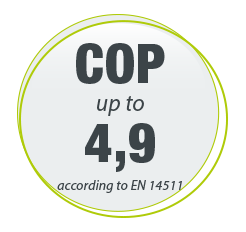 Outstanding COP: up to 4,9. 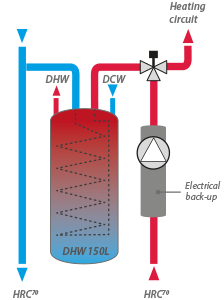 NNew DS pilot to produce domestic hot water, suitable to the full range (except HRC 35 kW and battery). 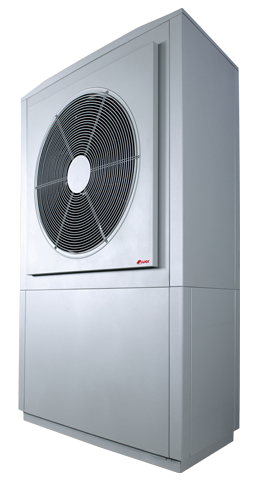 A genuine high-temperature heat pump which provides heating up to 70°C even on extremely cold days. 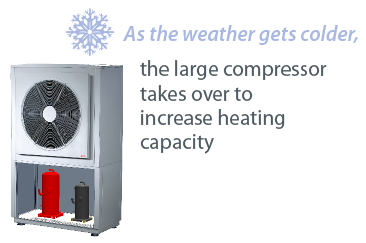 Modulating power: two compressors with different powers are combined, with a high compression level, to always meet your heating needs. Equipped with a multifunctional hydraulic pilot for a turnkey installation. 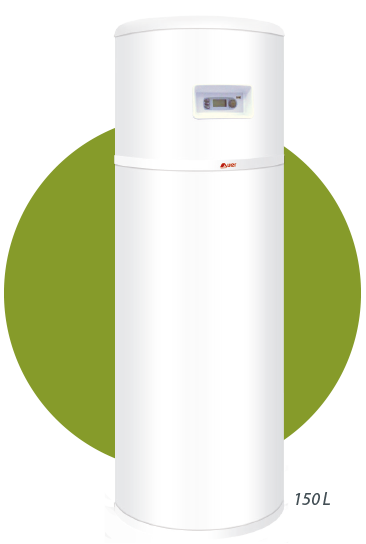 Can insure your domestic hot water tank heating without any back-up. 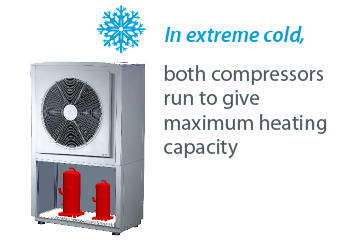 Runs using only the heat pump even when the outdoor air drops to -20°C. 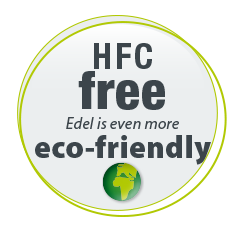 For 1 kWh of electricity, up to 4,9 kWh of heat goes back into the heating circuit, meaning a close to 80% energy saving. Very large diametre fan with variable speed. Noise-proof inlet cone for better airflow acoustics. 4 adjustable, shock-absorbing feet on the base. this one, the more it raises the temperature"
This is the most complete pilot, everything is integrated for an optimised and non-contraining operation. Can handle 2 heating circuits. Buffer tank integrated and boiler connection as standard. A keyturn solution, very easy to install on the existing heating circuit. The Premium pilot offers a lot of hydraulic connection possibilities. Everything is planned for that and the configuration is simplified. 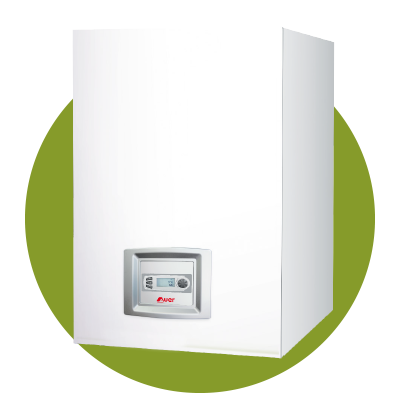 Fits perfectly for a simple and economical heating installation. 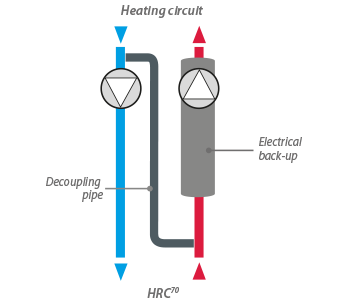 Decoupling of the hydraulic circuit between radiators and heat pump. 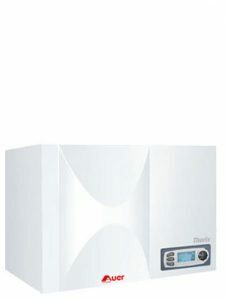 Electrical back-up 0 to 6 kW as standard. 20 years guaranteed cast iron heating body. Thanks to its 2 independant circulators, the XS pilot offers a very high working flexibility, as well for new installations as for renovations. UNIQUE ! 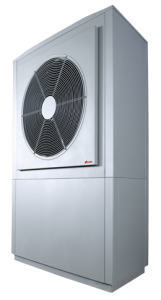 The heat pump HRC70 insures domestic hot water production without back-up, even during winter. Hydro-electronic pilot integrated to the tank, inside the house. 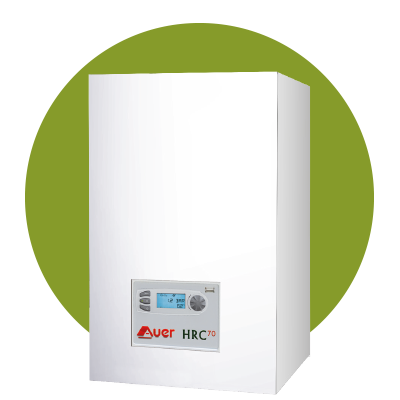 The perfect solution, compact and equipped, to manage both heating and domestic hot water circuits. 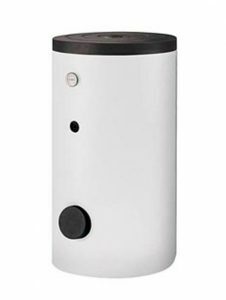 Electrical back-up from 0 to 4,5 kW as standard. 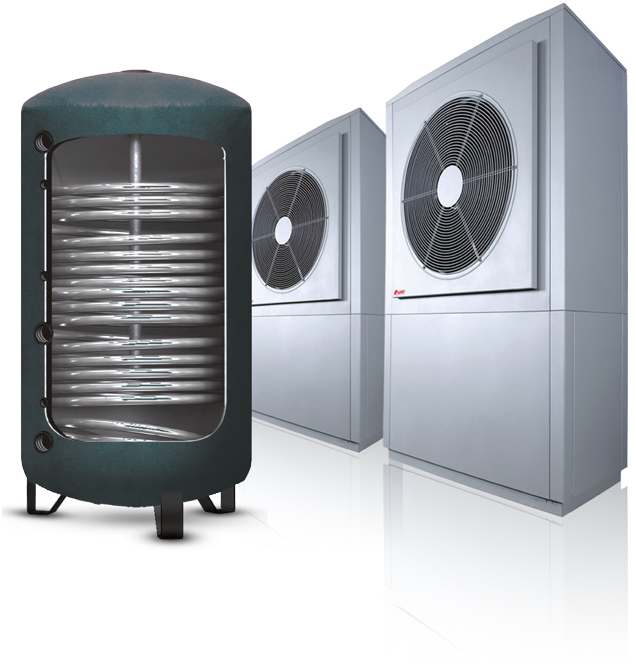 Large surface hot water heat exchanger. A full integrated solution easy to set up and to connect, will fit perfectly in a new house. 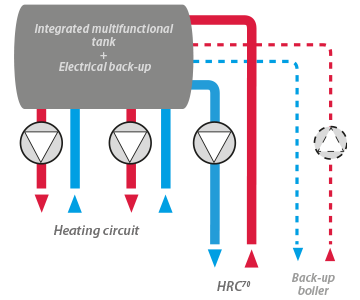 During a renovation, when the heating power becomes more important, it is possible to uncouple the heat pump from the heating circuit thanks to the multifunctional tank. Power start-up in progressive stages. 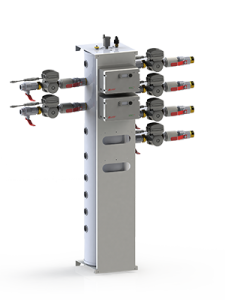 Wall-fitted hydraulic managment system including the control for linking 2, 3 or 4 HRC70. Brings total flexibility to the way the system operates. The inlet/outlet manifolds are reversible (right/left) so that the installation can be configured wherever you wish. 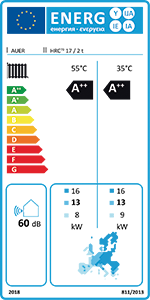 This highly efficient system guarantees safety and a long life span for your installation. Water capacity up to 12 000 L.
The solution for a low carbon impact (1,5 kg CO2 eq) compared to the market (5,6 kg CO2 eq. 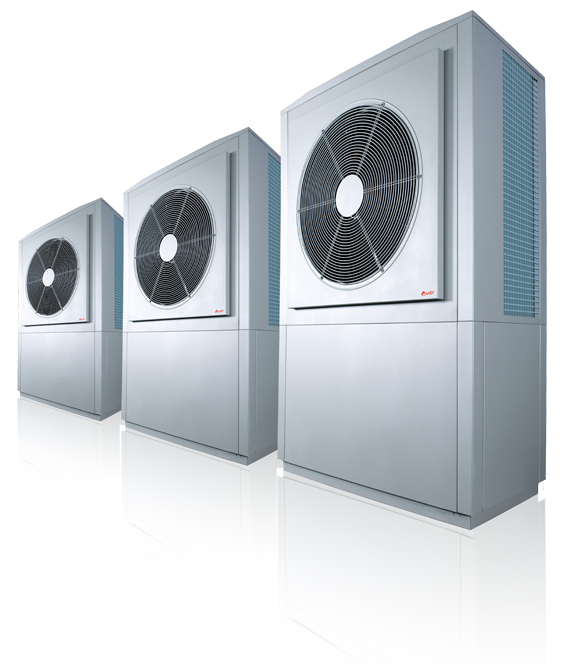 A monobloc heat pump: requires only. a simple hydraulic connection between external units and the hydraulic pilot.